Weil's so im Drehbuch steht. 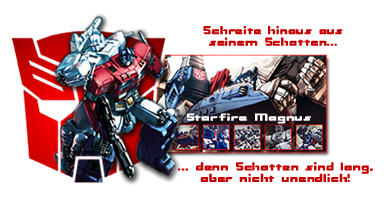 Alles Gute TF Movie G1 zum 25 BDay. Das war 1986, da gab's noch kein GPS. Wahrscheinlich hat er die letzten Koordinaten angepeilt (als Cyclonus angegriffen hat) und hat von da aus die nächstliegenden Planeten in Erwägung gezogen. JuuuH! Herzlichen Glückwunsch! Optimus Prime! Und Glückwunsch zu den Movies und TF Prime, wieder dabei bei TF, juuh! Cullen #1!! Es gibt zwei Videos in denen man Skizzen aus dem 86er Moviie zu Storys zusammen geschnietten hat. Here is a video I made of one of the deleted scenes from the 1986 Transformers movie. It's made using a set of production used storyboards I own. I have included a section of the film either side so you can see where it would have fit in. I believe this scene was animated as it exists in very late production notes & music was written to accompany it. It was cut as Nelson Shin felt it ruined the flow of Primes attack leading up to his battle with Megatron. Ultra Magnus, Tracks, Sideswipe & Red Alert were picked to attack Devastator as they all have rocket launchers. It also explains what Megatron was looking at when Prime found him. Hope you like. This is a deleted scene from the 1986 Transformers Animated movie, recreated from a set of production used storyboards. In the storyboards Ultra Magnus had a much more barbaric death at the hands of the Sweeps. As you can see in the video, he is literally pulled apart. This scene was animated but removed due to concerns over the violence. There are many clues in the film that this scene should still be there. The audio matches this version exactly, Magnus sounds like he is being pulled apart. You see the Sweeps fire out 4 solid beams towards Magnus. Finally Galvatron catches the Matrix when it falls perfectly into his hands from above. Das hab ich schon als Kind nicht verstanden. Bei Video 2 kann ich verstehen, dass sie dachten, das sei zu brutal für die Kiddies. Aber jetzt da ich Video 1 kenne, find ich das die Szene mit Devi doch im Movie fehlt. Video 1 wäre echt cool gewesen! Oder es lag einfach nur dran, dass UM ein neues Toy war. Nur UMs Rüstung war zerfetzt und er selbst hilflos im Torsostück gefangen? Hab mir grad Video Nr.2 nochmal angeschaut und zumindest machts nach dem mehr Sinn wieso Ultra Magnus in so großen Teilen da rum liegt. Sprich Arme, Beine und nicht viele Stückchen wie mans bei einer Explosion erwarten würde. Wirklich schade, denn so wird UM einfach nur zusammen gesteckt, polliert und alles bestens während Optimus oberflächlich nicht so stark beschädigt war. Vince Di Cola hat soeben getwittert, das es den Score vom 1986 Transformers Movie geben soll. Er kommt noch diesen Monat von der Firma Intrada/Sony auf den Markt. * FINALLY... My Transformers score will be released in a few months by Intrada/Sony!!! This will be the first 'official' release of the collection and I'm so excited to finally have the opportunity to inform my fans that this is actually happening! Obviously it took a very long time to reach this point, but hey... Good things take time, right?! When I have a definite release date I'll post it here, so stay tuned. Thanks to Doug and all the good folks at Intrada and Sony for making this happen! Hmmmh... ich hab den schon auf CD, offiziell lizensiert. Intrada? Ne gute Filmmusik-Ecke. Da kommt bestimmt noch etwas "special". Die Firma Kickstarter wird jetzt den Generation One Soundtrack neu aufnehmen und dabei soll eine bessere Qualität entstehen. Wann der Soundtrack dann auf dem Markt kommen soll, das steht noch nicht fest, aber wir halten euch auf dem Laufenden. Kickstarter bietet die Crowdfundingplattform, aufnehmen will das jemand anders. Wir haben hier einen VHS Rip gefunden, der ein Japanisches Takara Promo Video zeigt. Diese stammt vom 86er Movie. This is a rip of a 1989 Japanese VHS cassette that was released along with a poster to promote the soon to be released animated movie in Japan. 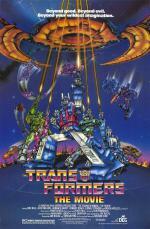 It served as a promo for the movie & also a "story so far" on the Transformers in Japan. It includes the original trailer for the movie, the intros to each Japanese cartoon show & some toy commercials from each, then at the end it shows the well known test footage for the movie complete with unused & alternate footage. Enjoy!